I have a thing for boots. It all started with a pair of sleek caramel-colored calfskin boots that I got for myself over a particularly cold winter (as much as sneakers were awesome, they were terrible against the biting cold and snow). That's the first pair that I got, and my penchant for them has been stuck ever since. I feel that boots are the most versatile footwear ever. They are sturdy and strong, and if you search long and hard enough you can always find a comfortable pair. There's many different styles- high knee, ankle, heels, no heels. Boots come in various textures too, be it calfskin or suede and everything in between. They can be dressed up or down, and I sometimes wear my ankle booties with formal wear! It can work with a suit if worn right. And of course, for safety issues, it offers my foot utmost protection when I'm out and about, and especially when I'm zipping around on a bike. The engineer and crafter in me will always itch to do something different to the things I own. I never like how my stuff looks drab or plain, and what could be worse than bumping into someone with the exact same outfit? Hence I always spice up my outfits with things that I make myself. There can never be an exact replica of what I'm wearing if it's made by myself. Similar, yes, but same, nope! 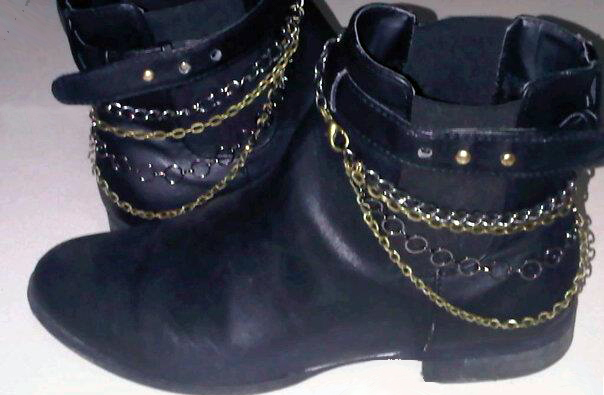 I added chains to my boots to give it a more rocker/grunge feel. I used thick black and bronze chains that I picked up from my local craft shops. I even included a lobster clasp so that they can removed. I love how they look, and they also tinkle as I walk. They look good with jeans and a simple tee. However, the chains are removed when I am riding as it's dangerous to have dangling accessories when traveling. I would always consider the overall design versatility and safety when it comes to designing my own accessories. All the consideration and tradeoff for form and function has been accounted for indeed. Love, love, love my boots!